From start to finish, our foods can be trusted, shared and celebrated. 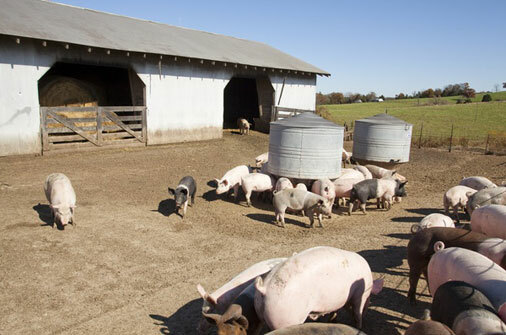 Locations: The vast majority of the hogs we use are raised in the Midwest by a cooperative of independent family farmers. Breeds: All of our pork comes from Heirloom breeds, such as Berkshire, Tamworth and Duroc, also known as Heritage breeds. Quality of Life: Housing for hogs is designed to protect them from physical and thermal discomfort, as well as from fear and distress. It also encourages the hogs' natural behaviors. They're kept in stable groups to promote community and are provided with deep straw bedding that allows them to root, rummage and chew. The sows raise their own piglets in comfortable straw bedding in barns — farrowing crates are never used. All of our hog farms are animal welfare certified through the third-party Global Animal Partnership. Feed: All hogs receive a constant supply of fresh drinking water and all-vegetarian feed, including corn, soy and vitamins. They are never given antibiotics or hormones. Most of our hog farmers feed their animals a diet that meets the Non-GMO Project Standard. The others are in the process of transitioning. Environmental Practices on the Farm: Our farmers practice integrated, holistic farming, which utilizes crop rotations; apply green and animal manure; use heirloom livestock and seeds. We use only humanely and compassionately raised hogs, cattle, turkeys and chickens.